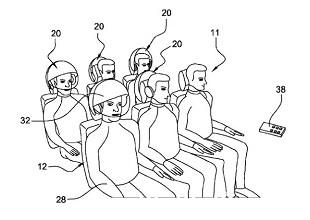 The future is...funnily-drawn people on an airplane with astronaut helmet-looking apparatus on their heads. Airbus wants to make your cramped, miserable flying experience a little more tolerable. And how's that? By attaching a virtual reality headset to every seat in an airplane. A new patent filed with the USPTO details such a rollout, and the initial rollout is equal parts genius, and comical. The headset would be attached to your seat's headrest, and the contraption would unfold over and in front of your head. The final form looks like an open-air astronaut helmet, complete with headphones for audio. Passengers could use the headset to watch movies or TV, as a display for some sort of computer (be it connected to your personal device, or some sort of onboard/cloud based machine), or just as a distraction from the outside world. The possibilities here are numerous, from enhancing the things you already do on a plane (the aforementioned movies and music), to new experiences -- holodeck, anyone? There are still a lot of blanks to fill in, like what kind of display would be used. The patent references "opto-electronic" displays (which sounds like the LCD-and-optics setup used by Oculus), but future technology would determine the final product. In fact, much of this will likely rely on how the world embraces virtual reality, both on cultural and technological levels. The initial scenario -- VR at every seat -- is thoughtful, but like any other airline perk? You know it's going to be Business- or First-Class exclusive, at least in the beginning.